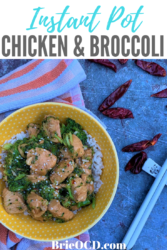 This instant pot Chicken & Broccoli is fantastic! It is full of flavor but won’t leave you feeling bloated and sluggish like takeout Chinese! If you don’t have an instant pot, don’t fret! It can be cooked in the Instant pot or stovetop! I have included stovetop instructions below! Per serving this recipe has 397 calories, 4.6g fat, 29.8g carbs and 54g of protein straight to the domepiece! These stats are for the chicken broccoli mixture and do not include rice or quinoa. 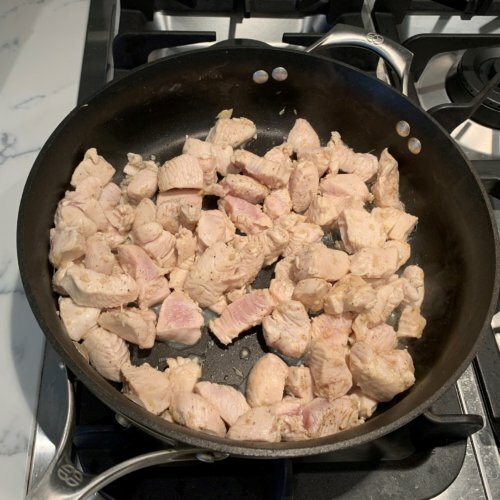 This recipe can easily be made gluten-free by using Coco Aminos or gluten-free soy sauce or tamari AND gluten-free oyster sauce. 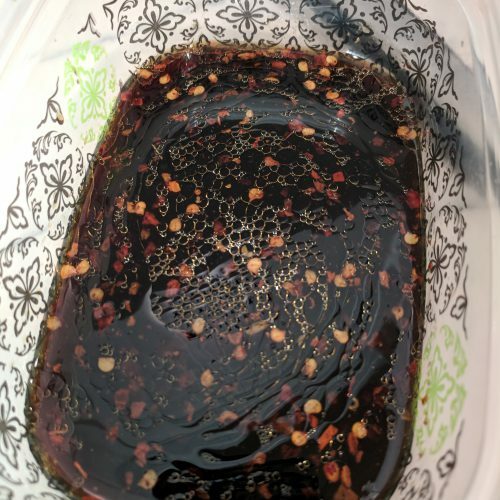 If you already have gluten-free hoisin sauce (from one of my other recipes like Kung Pao Chicken or shrimp and veggie stir fry) you can substitute that for oyster sauce, it just won’t be as liquidy! I buy the broccoli that comes in the microwavable bag (see image below). That way I just put the bag into the microwave and there is no mess or extra bowl to clean! 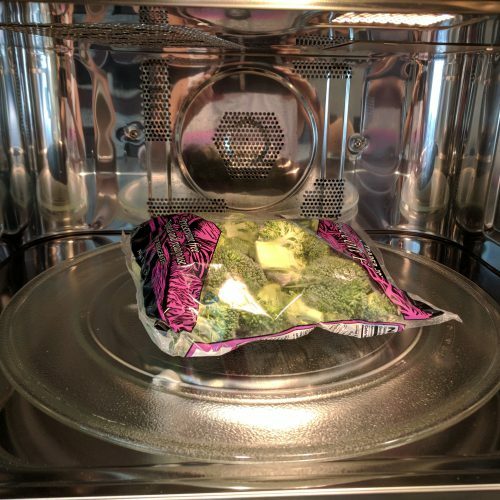 However, if you want to buy regular broccoli or already have a big bag that you need to use, you can put the florets into a bowl with 2 tbsp of water and microwave for about 3 minutes. Or, if you hate the microwave you can saute on the stove top until tender (but not too soft! ), about 4 minutes. 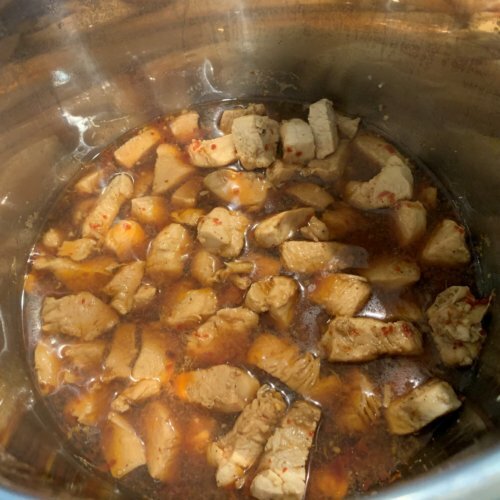 I made this recipe in the Instant Pot. You can technically make the entire thing in the Instant Pot but I always like to start by sauteing on the stove instead. Reason being, I think its easier and because you don’t risk burning the bottom of the instant pot and possibly cause it to malfunction later (those bits tend to burn). If you don’t own an IP then you can cook the entire dish on the stovetop. Simply follow the instructions below and Cook the chicken for 8 minutes (instead of 3). Then skip step 4 and continue with the rest of the steps doing everything in the saute pan. Voila! 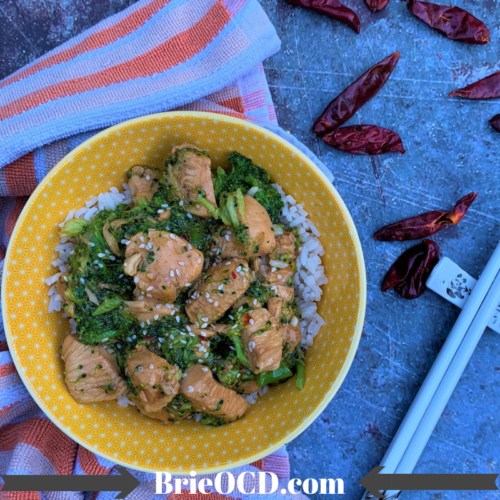 If you like this recipe you should try other similar Asian inspired dishes (click on each link to view the recipe) like Beef & Broccoli, Sesame Chicken, Orange Chicken, or Cashew Chicken! in a small bowl or tupperware combine all the ingredients for the sauce. set aside. cube chicken and mince ginger. in a large saute pan over medium-high heat, heat 1 tsp sesame oil for about 30 seconds. Add garlic and heat for another 30 seconds. add chicken, ginger, salt and pepper and brown for about 2-3 minutes. drain if necessary. 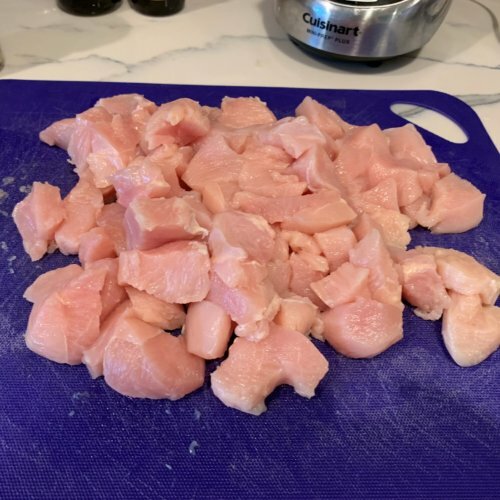 transfer chicken to Instant pot and cover with sauce. make sure vent is closed and set to high pressure for 5 minutes. Use 5 minute natural release (let IP go into warm mode for 5 minutes, then press cancel and release remaining steam). while chicken is cooking microwave broccoli for about 2 minutes. If eating with rice then make the rice now too. 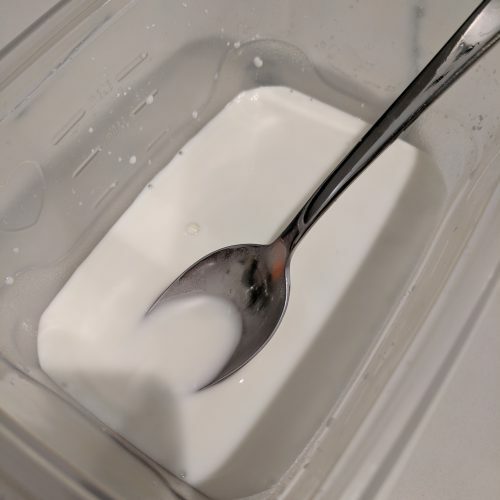 in a small bowl combine the ingredients for cornstarch slurry, stir well and set aside. Change instant pot setting to saute. 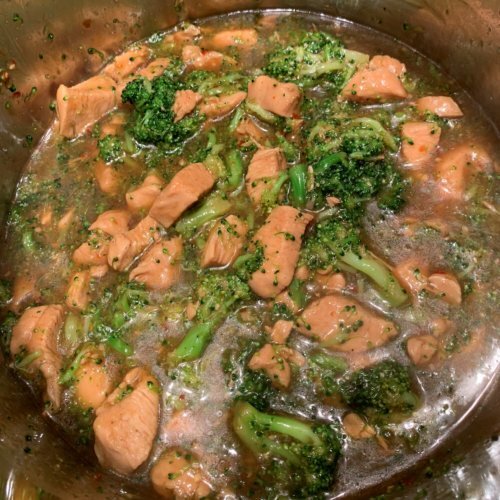 add broccoli and cornstarch slurry, stirring occasionally until sauce begins to thicken. 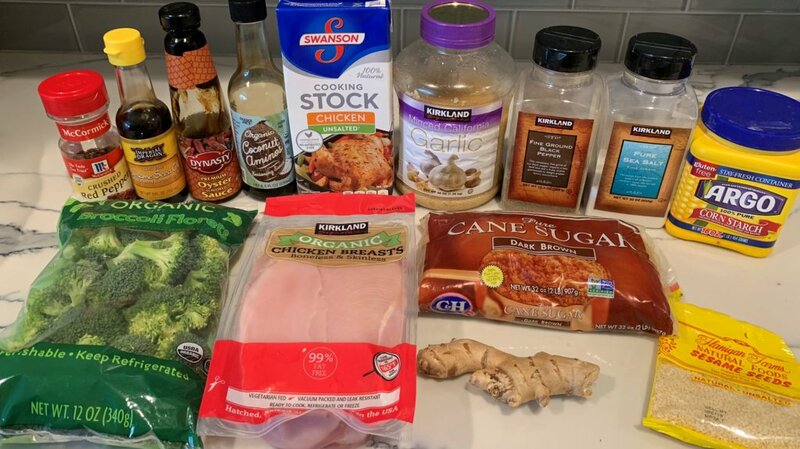 serve chicken and broccoli mixture solo (if keto) or over quinoa or rice! Enjoy!